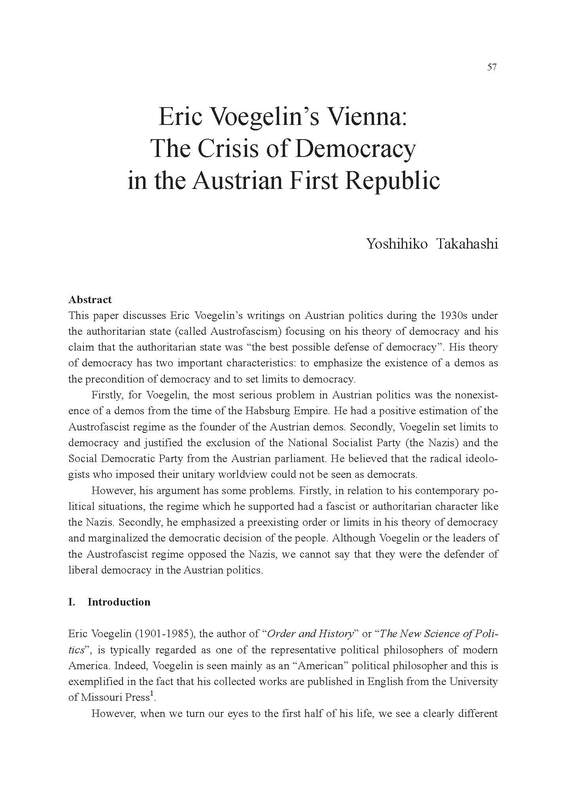 This paper discusses Eric Voegelin's writings on Austrian politics during the 1930s under the authoritarian state (called Austrofascism) focusing on his theory of democracy and his claim that the authoritarian state was "the best possible defense of democracy". His theory of democracy has two important characteristics: to emphasize the existence of a demos as the precondition of democracy and to set limits to democracy. Firstly, for Voegelin, the most serious problem in Austrian politics was the nonexistence of a demos from the time of the Habsburg Empire. He had a positive estimation of the Austrofascist regime as the founder of the Austrian demos. Secondly, Voegelin set limits to democracy and justified the exclusion of the National Socialist Party (the Nazis) and the Social Democratic Party from the Austrian parliament. He believed that the radical ideologists who imposed their unitary worldview could not be seen as democrats. However, his argument has some problems. Firstly, in relation to his contemporary political situations, the regime which he supported had a fascist or authoritarian character like the Nazis. Secondly, he emphasized a preexisting order or limits in his theory of democracy and marginalized the democratic decision of the people. Although Voegelin or the leaders of the Austrofascist regime opposed the Nazis, we cannot say that they were the defender of liberal democracy in the Austrian politics.